Strongwell’s DURAGRID® VE (vinyl ester) pultruded grating was installed in 1994 on a large metropolitan bridge in Camden, New Jersey. A 46” (117 cm) long sample from this installation was recently obtained for a strength, stiffness and durability study. The test was performed on a randomly selected piece of I4000- 1” (2.54 cm) panel. The panel was subjected to a three-point bend test, to failure, on a 42" (107 cm) span, and then retested to measure deflection and any remaining strength. Upon failure at the test peak load of 6,527 lbs. 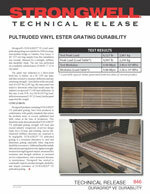 (2,961 kg), the panel was tested to determine what load would cause the industry-recognized ¼ " (.635 mm) deflection. In this case, it was 55 lb. At a 200 lb (90.7 kg) load, deflection measured 1.30" (3.3 mm), but the panel supported the weight. Strongwell products, including DURAGRID® VE pultruded grating, have been produced in conformance with quality standards that ensure the products meet, or exceed, published load table values at the time of production. This durability study demonstrates that DURAGRID® VE pultruded grating strength will meet and exceed industry recognized, in-service design loads, for an 20-year, and counting, service life, and measured stiffness decreases are expected to be negligible. DURAGRID® VE pultruded grating is a structural alternative to steel and aluminum grating especially when long-term durability is a concern. Additional benefits include fabrication requiring fewer tools, lighter in weight, measured strength against impact, measured fire resistance and strength retention at increased service temperatures, and a measured decrease in maintenance. Strongwell has worked to continually improve product strength, durability and impact resistance of DURAGRID® VE pultruded grating. Click here to review the entire case study.